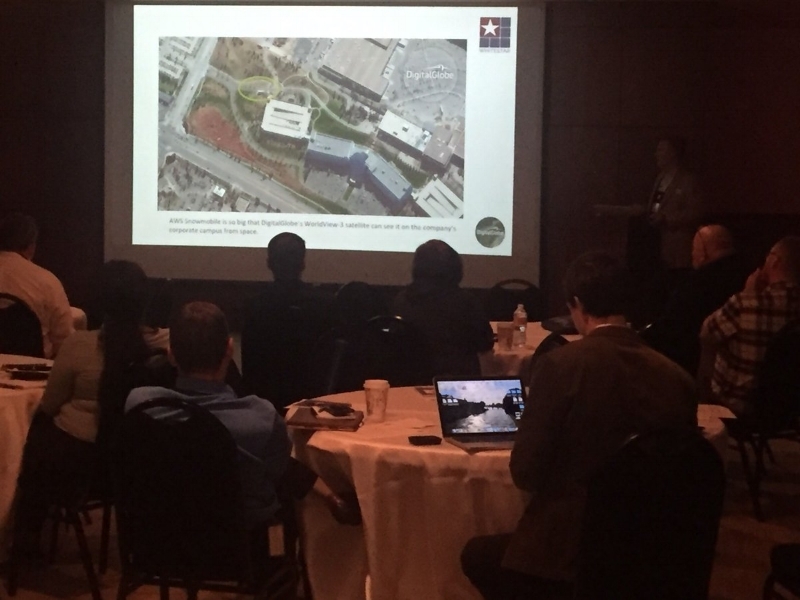 It was great to see nearly one hundred of you at our recent Lease Mapping Technology Seminars recently held jointly with DigitalGlobe at the History Colorado Center and the Houston Museum of Nature and Science. If you were not able to make it, let me briefly recap the content. I introduced both sessions and set the theme for the conference. Essentially, automating expensive workflows with a combination of software, data and services saves you rather astonishing amounts of time and money. Next, VP of Operations Mike Schiewe demonstrated our new Metes and Bounds upgrade for the WhiteStar Legal Mapper. The idea is to scan a lease document and have the corresponding polygon pop up on the map in the proper place, while saving the lease description in a proper GIS database. Of course not all deed data is neat, clean and tidy, but this enhancement will strive to get you as close to full automation as possible, and ever closer over time as we incorporate machine learning. DigitalGlobe speakers Kirsten Salter, Kreg Barrett and Shea Shelby shared the vision and capabilities of the DigitalGlobe Satellite Constellations and historical and most current image archives. Did you know they have moved 70 petabytes of data to the Amazon Cloud? This represents DigitalGlobe data can now be streamed directly to your desktop using Spatial on Demand services, available through WhiteStar. Andy Morris from DCP Midstream pipeline company delivered our Denver keynote. Notably, he is able to quantify the ROI on their GIS investments saving millions of dollars in operation costs as a result. Dale Lutz, a co-founder and VP of Safe Software delivered a lighthearted Houston keynote. He spoke about What history tells us about what’s coming next. Safe’s FME product can read and write most current and legacy data formats these days and have lately saved the PDF format from the tagline, “Where data go to die.” FME can even integrate the WhiteStar Legal Mapper to create consistently reproducible workflows. Jessica Schiewe, our QA/QC Manager gave a Denver talk on mapping Leases in the Trenches. Building a GIS database has multiple levels of complexity that all must be managed over time to produce the best possible representation of the Public Land Survey. Louise White, WhiteStar Partner, gave the last presentation of the day on how WhiteStar has scanned, logically named and georeferenced many thousands of GLO Plats to build the WhiteStar Plats streaming product. This database can be used to supplement any vector land grid with a faithful reproduction of the documents and maps of legal record. We will be offering an abbreviated version of many of these topics in lunch-and-learn format to your organization. Gather your folks together for an hour and a half, let us know, and we will be happy to present on these fascinating topics. If you weren’t able to make it to one of these events (or would like to revisit one of the talks), the presentation decks are available for viewing at https://www.whitestar.com/presentations/. All of the Low Hanging Fruit Has Been Picked!